If you are a parent who negotiates constantly with your child, you probably feel like you’re living with a little lawyer who “objects” to every rule and request and wears you down with endless questions and challenges. With some kids, everything becomes a negotiation, and it starts from the time they get up in the morning until the time they put off going to bed. Let me be clear: the more you give in to negotiating with your child, the more you’re training your child not to accept your limits. Many parents who over-negotiate with their kids mistakenly think it’s somehow improving their child’s sense of self worth. They think they’re letting their child be a little adult and that they’re recognizing them for who they are. Now, all those things are important, but the way for your child to achieve a sense of self worth is not by negotiating limits with you. And by the way, instead of “negotiate” I’d like you to consider the word “bicker,” because that’s what parents are really doing—letting their kids bicker and bicker with them. The parent goes back and forth with the child, when really, there’s nothing to negotiate here. Let me be clear: the more you give in to negotiating with your child, the more you’re training your child not to accept your limits. And the parent says “No, I’m sorry, you need to go to bed. Now I’m going to shut off the TV and you need to get going.” You know, that parent has set a limit and followed it and has given a reason why. This child also tries to negotiate her way down, but the parent sticks with the limit. I see that as a good, solid parenting style. Realize that a lot of the time, there’s nothing to negotiate. Be clear about the structure of how you handle business in your home. “We go to bed at 9 p.m. so we can be ready for school. School means everything to us, much more than TV. If you’re doing well in school, that doesn’t mean you should be able to stay up.” And that is something parents need to realize: if your child’s doing well at school, don’t stop doing the things that promote their good performance, like getting a good night’s sleep. And don’t let them negotiate with you based upon their success. There’s something called “medication rejection syndrome”. That’s when a patient is taking medication that helps them, but once they’re feeling better, they decide to stop. In a short amount of time they become sick again because they’re not taking their meds. Similarly, people do certain things to be successful, like getting enough sleep to be energetic and alert at school, and then when they are successful, they think they don’t have to do those things anymore. Predictably, you’ll see over time that they become unsuccessful again. Here’s another way of looking at it: I know people who go to casinos and play slot machines, and they inevitably lose. You know why? Because the machines are fixed to make sure they lose, but they keep playing because they think, “This might be my lucky day!” Here’s the reality: if the machine took their money in an hour, they’d never go back. But what happens is, the machine takes a little of their money, then gives some back, then takes more and gives a little back. Every now and then someone hits the jackpot, which keeps the excitement in the air. So at the end of the day, the person has lost all their money, but they’ve been trained by the machine to sit there and keep playing because they can’t tell if the pay-off is coming. It’s the same way with kids. Once you let them over-negotiate or wear you down, then your child never knows if this time he’s going to get lucky. He’s like a gambler. He doesn’t know if he’ll get his way this time or not. And since he has very little to lose, he thinks, “Why not take a shot?” The truth is, we are the ones who train our kids to do that. Hear this: kids are going to test limits, that’s their job. What parents forget sometimes is that it’s their job to stand firm. In some ways, parents confuse negotiating with somehow empowering their child. Believe me when I tell you, allowing your child to negotiate for things does not empower them. Instead, what empowers them is understanding the limits. With all these questions parents have about kids who push the limits, don’t forget, it’s the adults who have the power to change the limit. If you find your child is pushing the limits a lot, that usually means you’ve given them the power to change limits too many times, and now they’re looking to do it whenever they can. And your child doesn’t know the difference. Parents say things like, “Why are you doing this to me? I try to be nice to you and look what happens.” They say those things out of frustration, but the bottom line is that once you start changing the limits, as far as your child is concerned, there are no limits. Remember, kids are very black and white. Once you give them any gray area, don’t blame them for trying to get more. That is their nature; that is their developmental level. And by the way, if your child asks you for something, let’s say a later bedtime, and you think they have a point, tell them what they have to do to earn it. 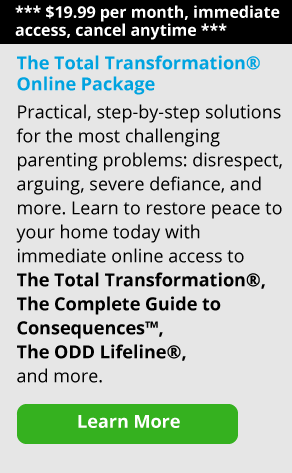 So if you think your child can handle staying up a half-an-hour later at night, don’t let them back you into a corner by negotiating with you and complaining to you about their situation all the time. Tell them what they have to do to earn that half hour, and tell them for how long. So you can say, “If you do this for a week, I’ll be happy to talk with you about staying up later.” What you’re doing is taking control back by rewarding your child for their good performance, instead of letting them push you into a corner. 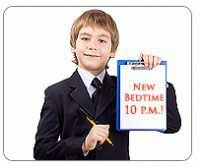 For instance, if your child wants to stay up later at night, if it’s a school night, the message should be quite clear that they have to go to bed and get a good amount of sleep. But you can say to your child, “If you go to bed all week without giving me a hard time, I’ll let you stay up a half-an-hour later on Friday and Saturday." That way kids learn to develop the fundamentals of negotiating so each person faces a win-win situation. Learning how to negotiate is an important problem solving skill in life. But don’t confuse that with bickering or wearing down people who are in authority.